Have you checked the backlink count of your website reported in webmaster tools? If not, I recommend you to log in and make sure there is no big difference in the number of external links pointing to your websites. Right now in my webmaster tools account, most of the backlinks to my blog are not appearing. You can understand the sudden shock it can give to a blogger. However, I recovered from the shock very soon because this issue happened for many website owners. Many webmasters are reporting the same issue in the Google product forum, blogs, and other webmaster forums. So my guess is Google may be changing the way to display external links pointing in webmaster tools or it might be a bug in their system. Update: Google seems fixed the issue. 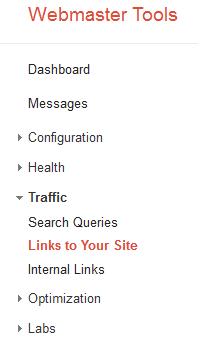 Now I can see the backlinks again in Webmaster Tools. Responsible webmasters always monitor the backlinks to his websites discovered by Google. After the Penguin update, lower quality backlinks can harm your website's performance in Google Search results. If you are not sure how to check the backlink count of your website, follow the steps below. if your website is new or if it does not have any backlinks so far, Google Webmaster Tools will not show any. All you have to do is to wait. How much does Google Adsense pay per click in India? It is recommended to register websites in Webmaster Tools for every webmaster to understand how big G sees our websites. You can see a log of useful information like crawl errors, search queries, HTML errors, etc. This information is very important for a professional Internet marketer to optimize his website. Similar to this if you want to set safe search permanently on your browser follow the instructions provided in the link below. Internet marketers work hard to increase the traffic to their websites. It is because the hike in traffic increases the income. AdSense is one of the most popular PPC programs which lets bloggers earn money from their traffic. It is true that getting an Adsense account is difficult nowadays. To learn more about it click on the link below. Google personalized search results are one of the important feature provided by Google. Sometimes you may want to see search results without any personalized effect. In that case, you need to turn off this feature. The following link tells the steps to disable this feature on Google Search. This article was written in 6th fab but i am noticing this currently on my webmaster data, earlier it was around 21 but now only link tin my webmaster account..what has happened any report? Hello Alex, I am too facing the problem. Last month my website had 4523 backlinks in web master tools. Now Google is showing just 1322 backlinks. Where should I complain about missing backlinks in webmaster tools ? It automatically fixed in my webmaster tools account. So I recommend you to wait for a little more time and see if Google fix it.